The above picture at first glance doesn’t look like much but from a geological perspective these rocks convey a lot of information about the history of the earth. This is what geologists call an angular unconformity. An unconformity is simply a gap in the rock record; it represents a period of time during which either erosion was taking place or there was no sediment being deposited. We call this kind of unconformity angular because the lower rock beds are tilted at a different angle than the upper beds. We know from the differences between the fossils in each of these rocks that there was about an eighty million year gap between deposition of the lower and upper rock sequences. During that 80 million years the lower formation was exposed above sea level, eroded, and tilted by tectonic forces in the earths crust. Eventually deposition resumed and the upper unit was deposited on the eroded and deformed lower unit. It’s amazing what you can learn from a few rocks! 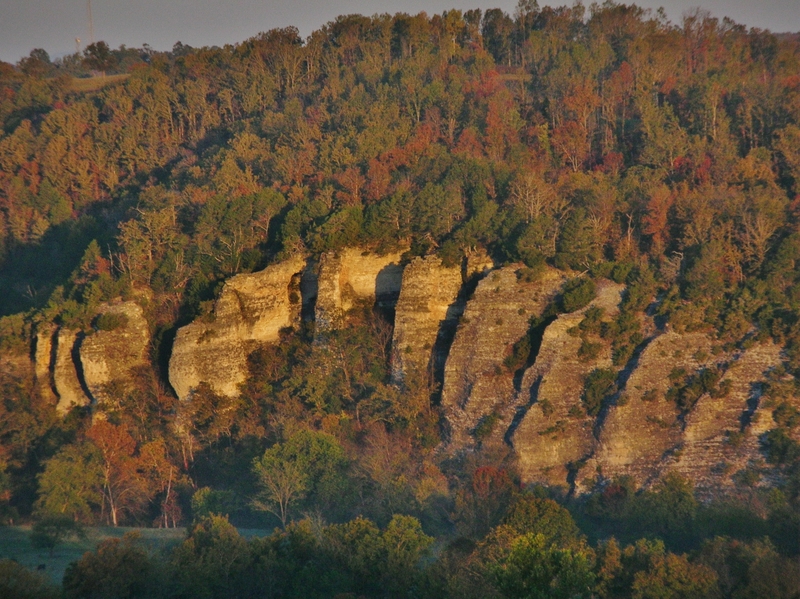 If you’d like to see these rocks in person, float the Buffalo National River from Tyler Bend to Gilbert. 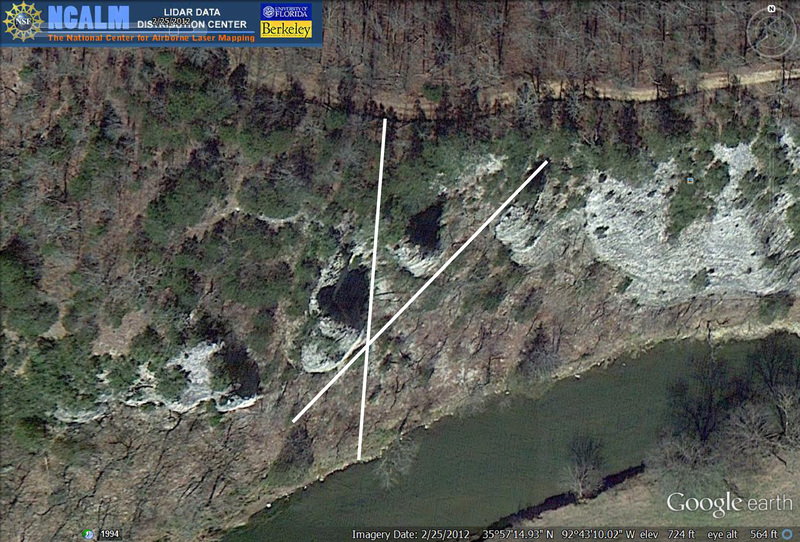 This entry was posted in #geoblog, GeoPic of the Week and tagged angular unconformity, Buffalo River, Mississippian, Ozark Mountains, silurian, tilted rock on May 1, 2015 by argeology. 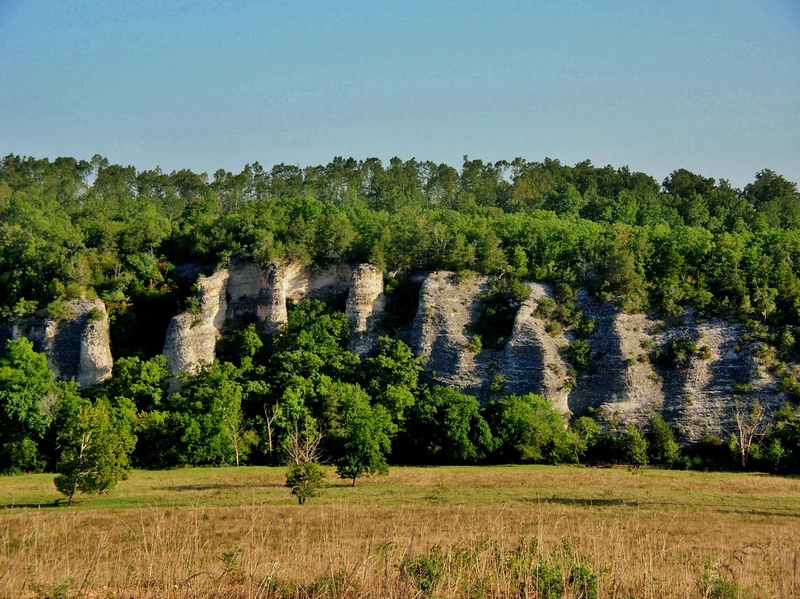 Dolomite and sphalerite are two minerals present in limestone and dolostone in the lead and zinc districts of north Arkansas. 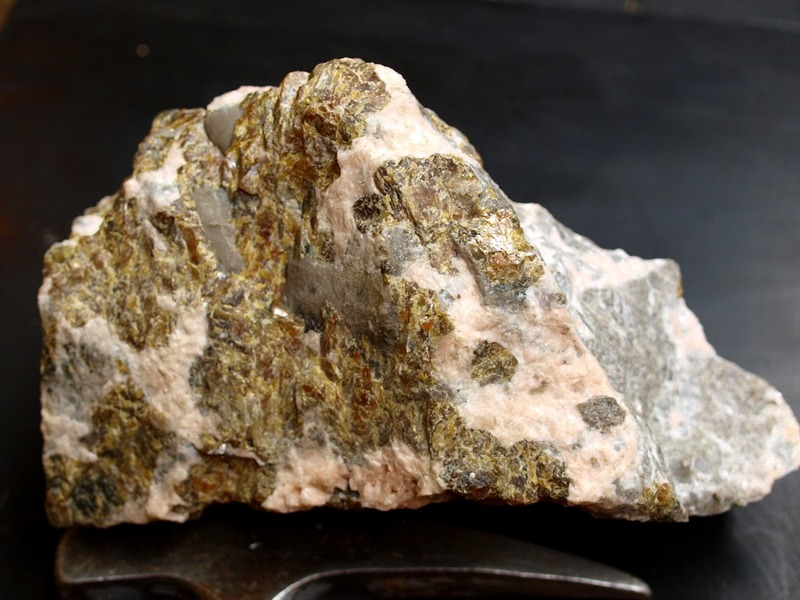 Dolomite commonly occurs with the sphalerite, however it is not an ore mineral and is considered worthless. Sphalerite is the primary ore of zinc. 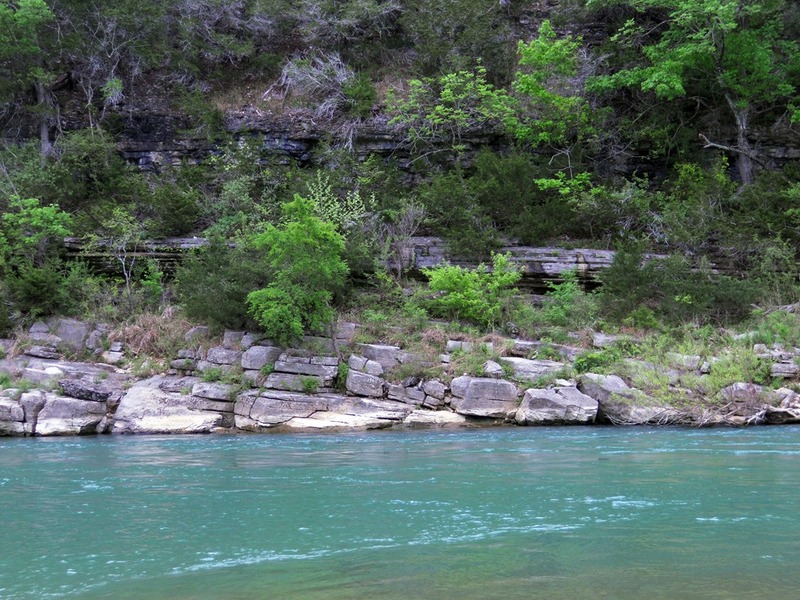 Zinc was mined in the lower end of the Buffalo National River in the late 1800s and early 1900s. One of the largest mining communities was located at Rush, Arkansas. Zinc is used as a coating of iron or steel to protect it from corrosion. It is also used in batteries, small non-structural castings, and alloys, such as brass. 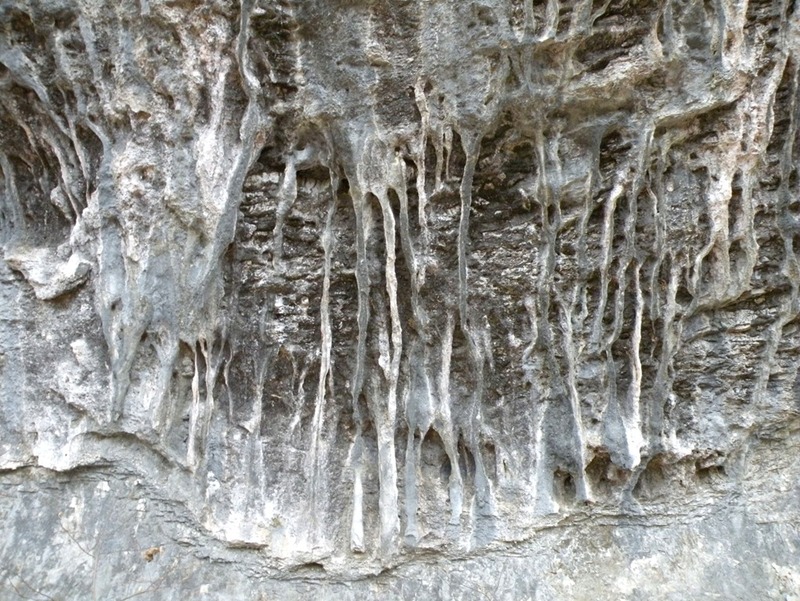 This mineralization is present in the Everton Formation. 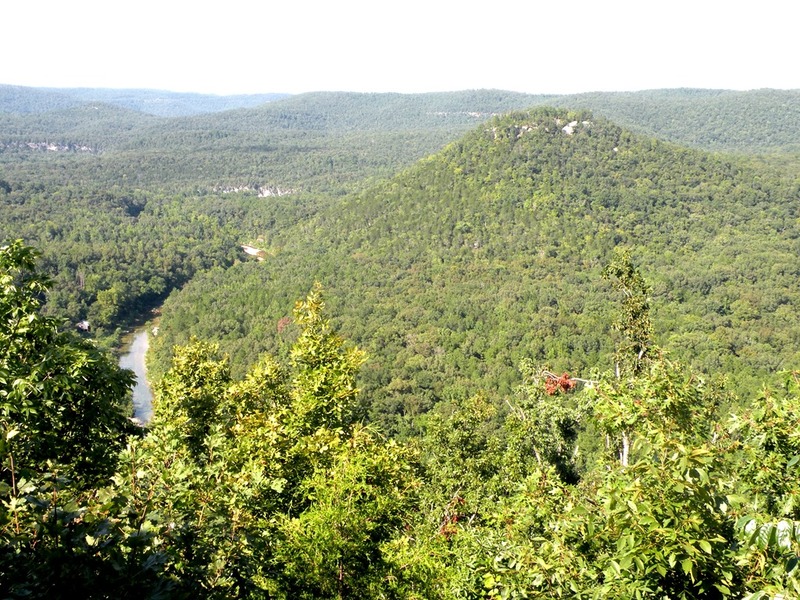 It is thought that migration of warm mineral-rich fluids expelled by the pressure of the mountain building event that caused the Ouachita Mountains is responsible for the mineralization in northern Arkansas. Note the brecciated texture (angular fragments) of the rock. Open spaces, called cavities, in the rock caused the overlying rock to collapse, and break into angular pieces. Mineralized water then flowed around the broken pieces and the dolomite and sphalerite precipitated in the open spaces. 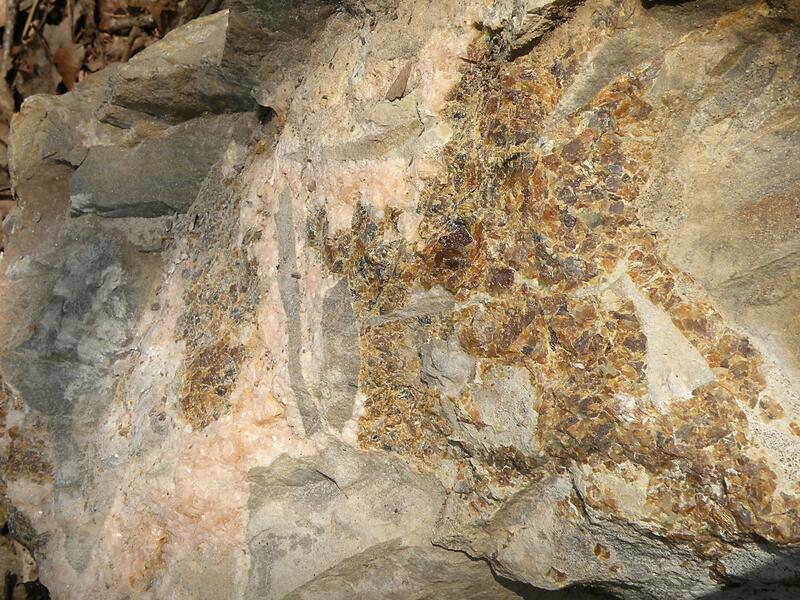 This entry was posted in GeoPic of the Week and tagged Buffalo River, Dolomite, dolostone, Everton, limestone, sphalerite, Zinc on November 7, 2013 by argeology. Signs that summer is almost over despite the continued warm temperatures include the silencing of cicada calls one at a time. A welcome turn of events! 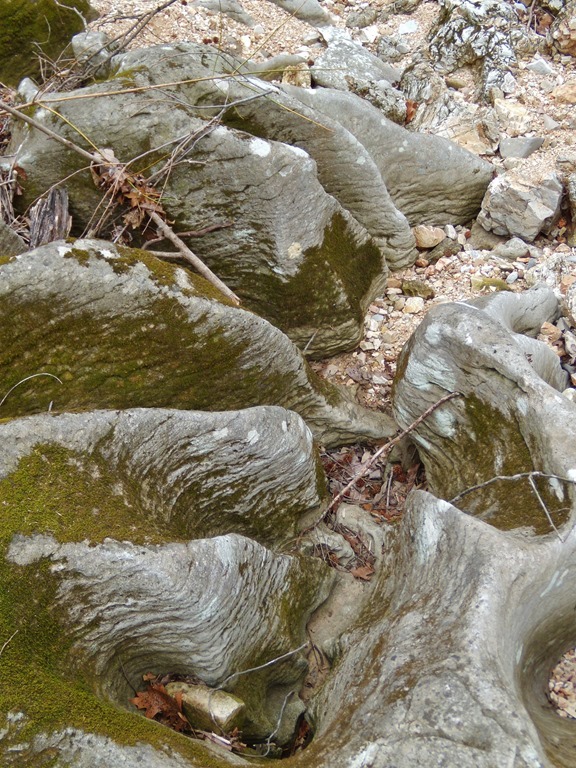 irregular-, channel-bedded sandstone unit with abundant soft-sediment deformation near the top of the Imo. It’s so irregular that I was calling it “crazy-bedded” before long. There was also a section in the middle of the Cane Hill that was so perfectly cut by its east/west joint that it formed a smooth wall on the north side of the creek. 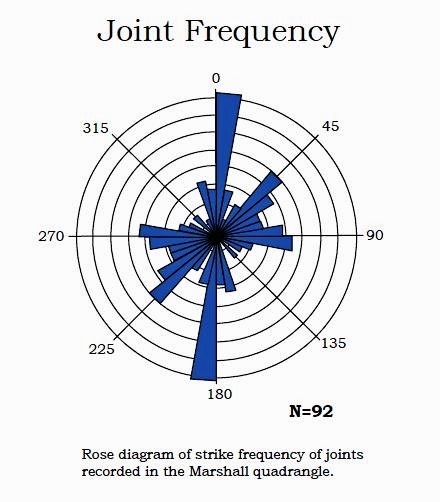 There was a parallel joint face on the south side, but it was not nearly as well exposed. On Tuesday evening we joined Angela Chandler and Lea Nondorf, also of the Survey, on Bear Creek in Marshall to work on several other projects the rest of the week. One ongoing project is to try to resolve edge-matching issues whenever we get a chance. This involves gathering new data in boundary areas between quads that were mapped by different people or who used a different stratigraphy. This week we were also looking for localities in the Imo interval for an upcoming field trip that Angela, Erin Smart and I are leading this spring for the GSA (Geological Society of America) conference in Fayetteville. While looking at various road cuts, we also took new points on an area in the corner of four quads. Wednesday and part of Thursday we looked at several possible field trip stops in the Imo, none of which seemed particularly suitable for one reason or another. Mostly this is because the Imo doesn’t tend display good outcrops in this area due to its shaley composition and its typically being covered by the flaggy sandstone of the Cane Hill above. We did visit the type section which is in Sulphur Springs Hollow to see if that could be used as a stop, but deemed the area too rugged unless a very small, sturdy group of geologists sign up. A type section is an area where a formation or rock unit is first described and studied in detail. In this case the type section was proposed then summarily abandoned, but there are those working hard to see it reinstated eventually. Another project that we are working on for the National Park Service is a compilation of all the quad maps along the Buffalo National River. Our agency and the US Geological Survey have each done about half of the quads in that area. Most of the quads mapped by our agency did not include the higher terrace levels above the river–some as high as 200 feet! This week we were able to get points on a few more of these terraces on the Snowball quad. We looked in Arnold Bend Thursday afternoon, and differentiated several terrace levels there, then on the way back to town, we stopped at a roadcut on Hwy. 65 that Angela knew about where there are quartz crystals growing in fractured Boone limestone and chert. Danny had stopped at St. Joe on a previous field trip and so directed us there to see the quartz and calcite crystals encrusted on some of the old building stones in town. These stones were no doubt found nearby along the several mineralized fault zones in the area. The next morning there was fog on Bear Creek and we headed up to Jamison Bluff to look for Plattin in the riverbed where it had been mapped previously. This is part of the 6 mile section of the Buffalo between Woolum and Margaret White Bluff that dries up during the summer. All we could find was St. Joe, so that part of the map remains as is. We crossed the Buffalo at Woolum and walked along the top of Skull Bluff to the Nars Cemetery most of which was covered with a terrace deposit (along with almost impenetrable black locust, cedar and briars). And of course, we couldn’t leave the area without a quick trip to “the Nars” itself for Danny and Lea to see for the first time. “The Nars”. Buffalo River left, Richland valley right. 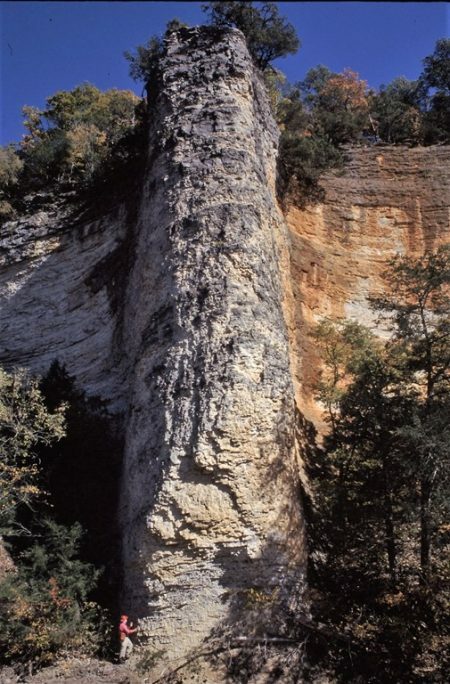 “The Nars” is an almost sheer rock wall in the Boone formed as an erosional remnant between the valleys of the Buffalo River and Richland Creek. Quite impressive as usual. After that we had to get back to Little Rock and “the real world”. See you next week. 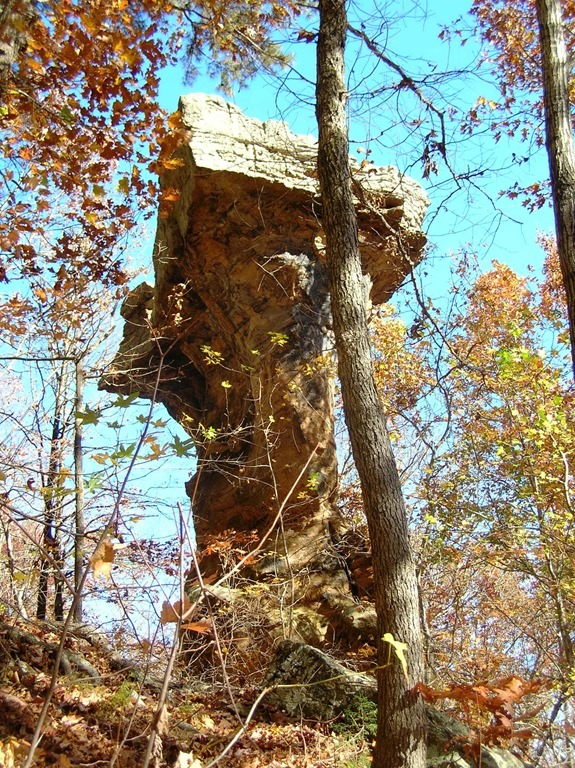 This entry was posted in Notes From The Field and tagged Arnold Bend, Bear Creek, Buffalo River, Cane Hill, deformation, Imo, Marshall, Plattin, Skull Bluff, St. Joe, Sulphur Springs Hollow, Tick Creek, Woolum on October 2, 2013 by argeology.